Billy Joe Saunders and Martin Murray have both predicted that they will need to be at their best for their all-MTK Global world-title clash at London’s O2 Arena on Saturday, April 14. Saunders and Murray went head to head at a fight-launch press conference hosted by promoter Frank Warren in the English capital today (Thursday) ahead of their WBO middleweight title showdown, which will be screened live in the UK and Ireland on BT Sport and BoxNation. The MTK Global stablemates were respectful and courteous to each other throughout, but both fighters admitted that their fight-night will not be a civil affair due to their respective ambitions. Defending champion Saunders is still targeting a future bout against Gennady Golovkin or Saul ‘Canelo’ Alvarez as he aims to one day unify the 160lb division’s world titles. While the Hatfield native was at his best during a recent victory over Canadian David Lemieux, he insisted that Murray is capable of upsetting his grand plans. “The Lemieux fight is behind me now,” said Saunders. “To be honest, Martin Murray brings more of a threat than Lemieux. “Martin, in my opinion, should’ve been world champion twice. People say he’s aged or whatever, but you only have to look at his last few performances to still it’s still there. “I take my hat off to him for taking the fight and I’m happy to give him the opportunity to fight,” added the 28-year-old champion, who reiterated his intention to retire by his early thirties. In contrast, April’s bout is likely to be Murray’s final shot at a world title and the 35-year-old challenger is determined to make it a successful one. The St Helen’s man previously came out the wrong side of contentious points decisions against Felix Sturm and Sergio Maritinez in world middleweight title bouts, while he also lost out to Gennady Golovkin and Arthur Abraham – the latter defeat coming at super-middleweight. “Hopefully it’s fifth time lucky,” said Murray, who admitted that he had contemplated retirement before holding out for one last shot at a world title. 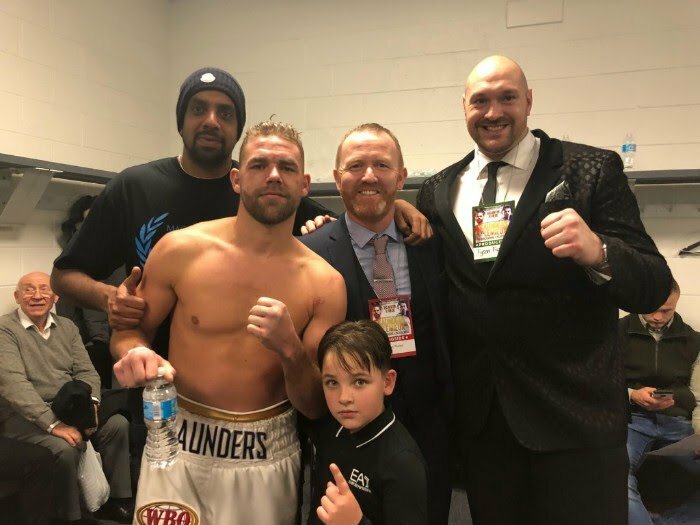 The bookmakers have already installed Saunders as a money-on favourite to defeat Murray following his master-class victory over Lemieux last month and the champion hopes a win in London will finally tee up a showdown against Golovkin and ‘Canelo’. However, the WBO champion believes the impressive nature of his win over Lemieux means many in the 160lb division are keen to avoid him. “I think that the Canada performance was good in one way and bad in another because it was good for my stock, but bad for business,” said Saunders. “Golovkin and Canelo are not scared, but the people that look after them… they don’t want someone coming in and giving them a hard night’s work or beating them. Saunders will, of course, have to get past Murray if he is to book a unification fight, but the challenger is keen to defy the odds and cause an upset. “I’ve been unlucky, but that’s boxing,” said Murray on his past world-title fight defeats. “I’ve taken took fights that most fighters probably wouldn’t take, but everything happens for a reason and it’s paid off in one way or another because obviously I’m here now and I’ve got my fifth chance. *Tickets: 02 presale tickets available via www.axs.com from 10am tomorrow (Friday); general sale tickets from AXS, Eventim and Ticketmaster from 10am on Monday, January 29. Prices: £40 (Tier), £50, £75, £100, £150, £200 and £300 (Hospitality).